I spent much of my weekend preparing for a totally meaningless and fun Edible Book Festival at the unnamed university’s library. The Festival offered few rules and tiny prizes, but that didn’t matter. I was in it for the festive business of wild artmaking. Art project. You can tell by the way you suddenly feel inspired to throw eggs at it. I had an idea I loved and loved thinking about and loved imagining how it would be received. Tiaras, bouquets and double-stick tape aside, it was fun thinking. It was fun to buy pie crusts and phyllo and I Can’t Believe It’s Not Butter in spray form. No, I didn’t use butter and a basting brush because I am an artist, not a pastry chef. This is art. No one is going to willingly eat it. Anyhoo, my first attempt turned out beautifully on Saturday, two days before today. It didn’t stand a chance of surviving to this morning, except that it did. 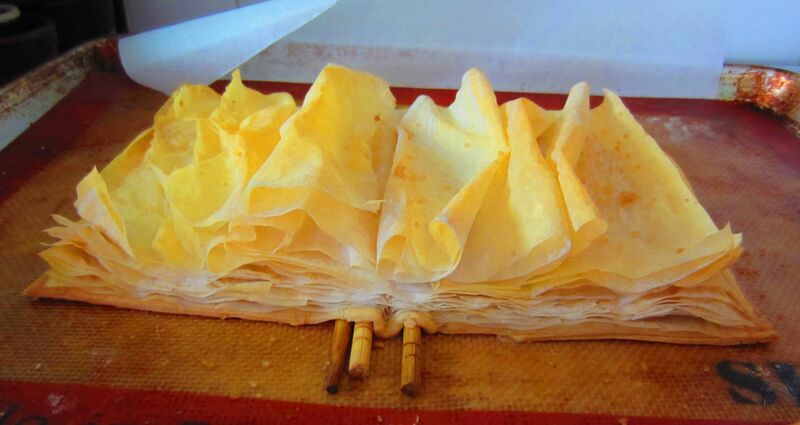 Last night, I made another, slightly larger pastry book that turned out just as crunchy but less elegant. I packed them both to transport 2.2 miles and hoped one would make the brief trip. To my surprise, both survived. I put them on a marble lazy susan borrowed from my boss Gianna and put the pastry books out among the exhibits. It won a small prize I will put toward a science kit for my grandchildren, which is great because baking is science and science kits for my grandchildren are also fun – for me. This entry was posted in compote something, Panky, This Never Happened To Pablo Picasso. Bookmark the permalink.